The folding chairs formed a circle in a nondescript room—wood floors, brick walls, cups and a pitcher of water on the floor in the corner. It looked like every 12-step meeting ever depicted on screen. It was, instead, my first improv class ever. The day before we took our seats in that circle, my daughter Kristi and I finally signed up at Third Coast Comedy Training Center in Nashville, TN. 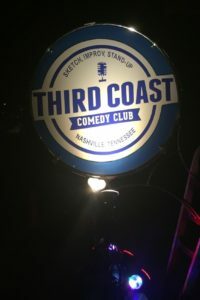 Our class was at Third Coast Comedy Club in Nashville, TN. Photo by Joe. Our class of twelve had just finished playing one of those mixer games I’d always hated as a youth leader. Say your name with some elaborate a motion. It was supposed to help us remember everyone’s names and loosen us up. Sitting in the circle we take turns introducing ourselves—name (again), interest in the class, and any experience we have. I thought this might be coming, so I had prepared an answer—this was my first improv class—but I wasn’t ready for the answers from my classmates. When the person to my right finishes, it is my turn. “I’m Joe, and I’m way out of my comfort zone,” I begin. “I write for a website, spending most of my day behind a screen.” I decide they don’t need to know that I’m a terrible actor—high school church productions provide irrefutable evidence. Sure, I have experience and comfort on stage preaching, speaking, and leading praise bands, but that is not performing. I am always me. In that split second, I remember the time I wasn’t. As a seminarian, I preached one of those “first person Bible character” sermons. To the people of the West Creek United Methodist Church who endured that experiment, I’m sorry. “As part of my job,” I continue, “I host a podcast where I interview people. I’ve heard improv can help me get better at listening and responding.” People nod, including the instructor. Ok, that’s enough. So began my journey into improv. After graduation from Level 1, I’m still a terrible actor with no desire to perform, but I’m so glad I took this class. In addition to helping my interviewing abilities, my foray into this art form has me thinking about life, church, and my spiritual journey in new ways. In a series of posts over the next several months, I will share some lessons for life from improv. Things like ‘yes, and…,’ justification, claiming space, bringing a brick, taking care of yourself, and more. In the spirit of improv, I hope you will participate in the conversation. Email, tweet, or Facebook your comments along the way. Maybe thinking together in a new context will be illuminating.